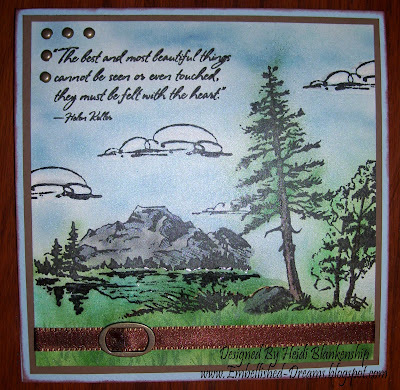 Sneak Peek #2 is being done by Jennifer Ellefson so make sure you stop by her blog Created From Paper (July 1st) to see what new dies she has for her Sneak Peek and what she has designed. Don't forget to sign up for the drawing on her blog!! 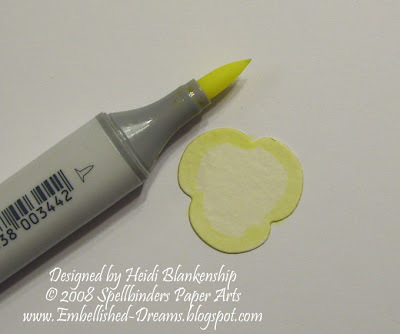 Debbie Olson did the first Sneak Peek on her blog Thinking Inking. If you missed her Sneak Peek make sure you stop by her blog to see the new dies and enter for the give a way on her blog and also for a chance at the Grand Prize Drawing you have to stop by each blog listed in the Sneak Peek and enter the drawing. The complete Nestabilities Birthday Party Schedule can be found in my side bar right under my profile. Hope you have a great day & Good Luck!! Spellbinders has so many wonderful Nestabilities shapes--circles, ovals, squares, hearts, paisleys and we can't forget about the STARS. Since tomorrow is the beginning of the Nestabilities Birthday Sneak Peek Celebration I thought I would share one of my Spellbinders Design Team Gallery Projects with you. Thank you so much for stopping by today!! Don't forget tomorrow is the BIG DAY--The kick off to Spellbinders Nestabilities Birthday Party!! 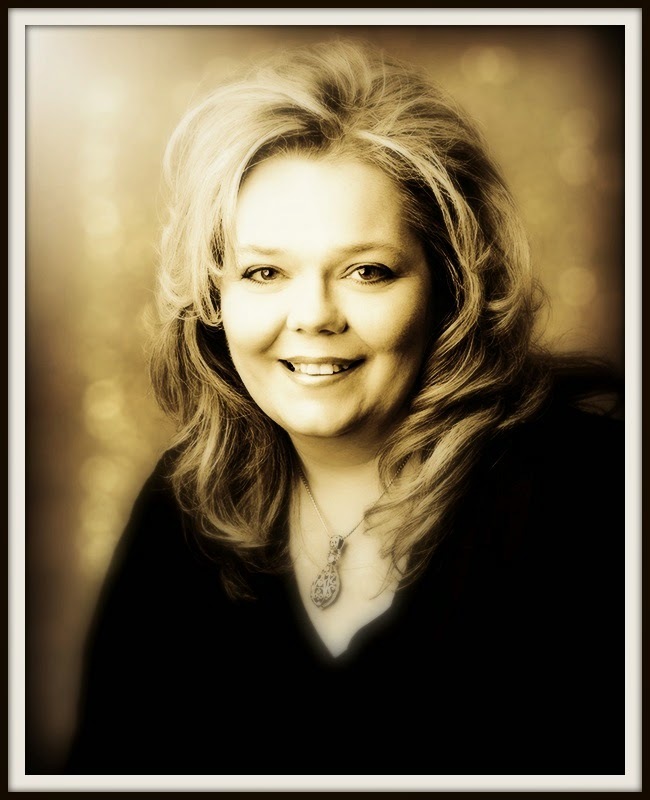 Debbie Olson will be having the 1st SNEAK PEEK tomorrow (June 30th) so make sure you stop by her blog Thinking Inking!! Hope you are having a Wonderful Weekend!! Nestabilities Birthday Party *+* Spellbinders Sneak Peek *+* & So Much More!!! Are you ready to PARTY? 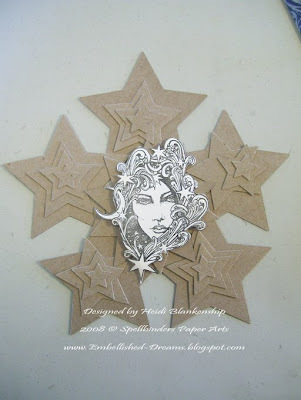 I mean I am talking a Mind Blowing, Super Fantastic Birthday Party with Spellbinders Paper Arts!!! You know who they are. The one and only makers of the Nestabilities!! The Spellbinders Nestabilities are turning 1 and to celebrate Spellbinders is having a party for two weeks!!! The Designers for Spellbinders will be giving daily "Sneak Peeks" for the new dies being released at Summer CHA for the next two weeks!! But wait there is MORE---a Sneak Peek will be posted each day on a different Spellbinders Design Team Member's Blog AND if you click on a Special Drawing Link that will be available on the day of the sneak peek you will have a chance to win the die that is in the sneak peek!!! 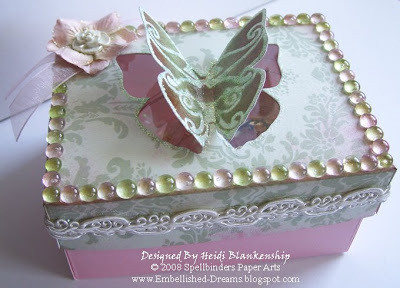 You can also share your thoughts with each Spellbinders Design Team Member by leaving a comment on the blog post. We would LOVE to hear your thoughts!! Are you sitting down? If not you should be!!! You will have a chance to win the NEW RASPBERRY-Colored WIZARD AND $500 WORTH OF DIES from SPELLBINDERS!!!!! Below is the list of Design Team Members and links to their blogs. The Celebration starts June 30 and goes until July 13. I hope you take the opportunity to visit all of the blogs and don't forget to leave a comment for a chance to win some fabulous prizes!! More information can be found here on the Spellbinders website. LET'S PARTY and GOOD LUCK!!!!!! A great way to spend a hot summer day is to kick back and relax and sip on a nice cold glass of lemonade. 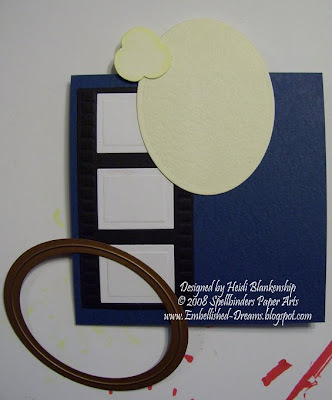 But if you'd rather be stamping and paper crafting how about a fun summertime card. Here is a card that I made for one of my Spellbinders Design Team gallery projects. We were given a challenge to use a die in a different way on one of our projects. Do you see the cute little slices of lemon, they are really the wheel (cut in half) from the Wheelbarrow Die (S3 136) from Spellbinders! 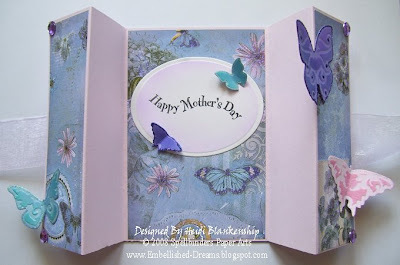 Click HERE to see a card made with the Wheelbarrow die. The card is a 6 x 6 and I used WorldWin-Luscious Lime Rich DoubleMates, Meri-Gold Vivid and Georgia Pacific White Card Stock . 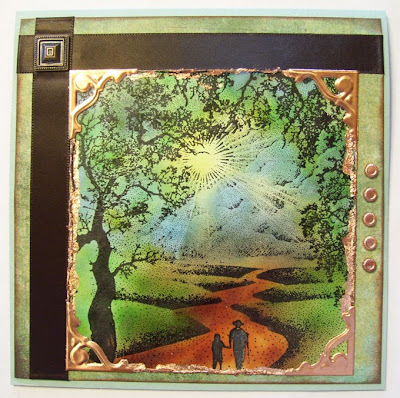 I used the Small Classic Square Nestabilities from Spellbinders for the stamped image and the matting. 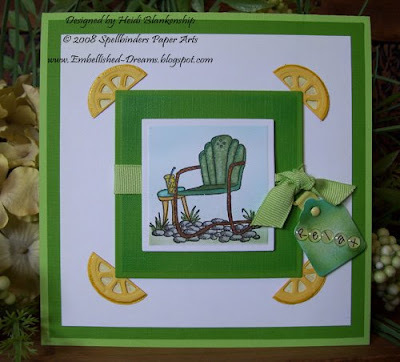 The stamped image is the Vintage Garden Chair (2083) from Lockhart Stamp Company. The image was stamped using Brilliance Graphite Black ink and colored in using the Copic sketch markers and the air brush system. The sentiment on this card is very simple just the word Relax. To make the tag I used the Tags 5 die (S4 081) from Spellbinders and bubble sticker letters from Joann's and then airbrushed a little yellow and green. I used some light green ribbon, a yellow brad and some hardware from Creative Impressions to attach the tag to the card. I also added a little sparkle using a Spica Glitter Pen (05 Lemon) from Copic on the lemons and the glass of lemonade. I hope you enjoyed the card for today and thank you so much for stopping by!! Tomorrow is my little guy's Birthday!! I can't believe he's gonna be 6 years old!! I hope you have a Wonderful Day!! 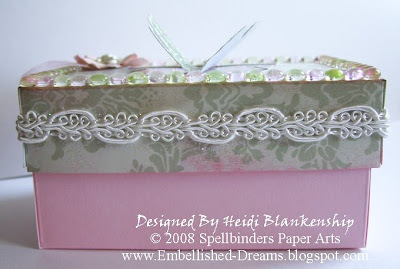 Also don't forget to check out the Spellbinders Design Team Gallery, new projects are being posted!! Back in May for my birthday I received a Wonderful Surprise package in the mail from my dear friend Ema! Ema and I met a few years ago on a message board and we became really close friends. We have never met IRL, maybe someday. But for now we share emails, phone calls and lots of laughs!! One day we were talking about some crafting things we both wanted and one of the things that came up was the Scor-Pal. Well GUESS WHAT I got for my birthday!! Yep you guessed it--a Scor-Pal and I LOVE IT!!!! I can't believe all of the amazing things you can make with one of these little babies!! Plus you can go to the Scor-Pal website and they have tons of ideas and templates for all kinds of projects. I'm sure there is a ton of you out there that already have the score pal and love it. It was just one of those things that I wanted but I wasn't sure how much I would really use it and now that I have had it for a while I use it a LOT! I sometimes wonder what I ever did with out it!! Thanks again Ema!!! I am still loving my Scor-Pal!! Also don't forget to check out the Scor-Pal website for TONS of great ideas!! These little boxes are so quick and easy to make I think I might make a few of them to have on hand! Thank you so much for stopping by today--I can't believe it's already Friday!! I hope you have a Fantastic day and a Wonderful weekend!! Do you ever have movie nights with friends or do your kids? Here is a great card that you could use for your next movie night or it would also work great for a birthday invitation too. This is a card that I made for one of my Spellbinders Design Team projects. For this card there is no stamping involved! 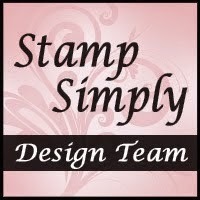 Yep that's right--no stamping! Almost hard to imagine isn't it--LOL! 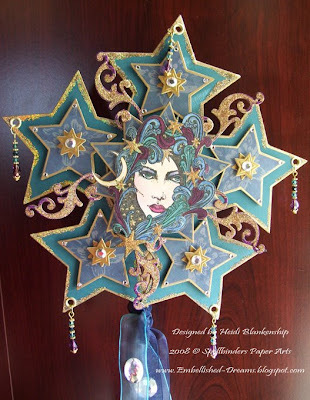 The sentiment was printed out on the computer, the stars are felt cut outs from Fancy Pants and the rest of it is done with die cuts made using the Wizard and various dies from Spellbinders. Guess what die the Popcorn is from? It's not a popcorn die--try thinking out of the box. Once I had all of the popcorn pieces done then I started to assemble the card. The Film Strip die works great to go with the movie theme. 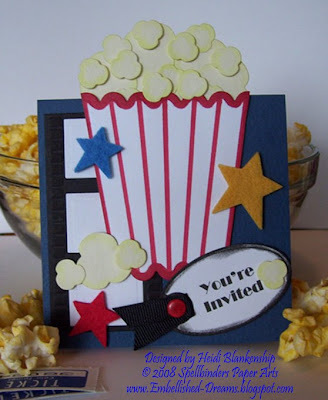 I used a Oval Nestabilities die to make a back drop for the popcorn. Then for making the popcorn container I used the Sm. Scallop Square Nestabilities, I cut the sides at an angle and then made the stripes and outlined the container using a red Copic sketch marker. The sentiment was printed out and then cut out using one of the Tags 5 dies. To finish it off I added the felt stars, a little black ribbon and a red brad. 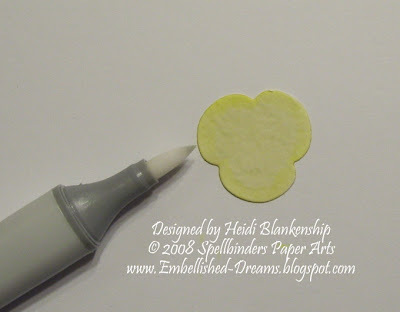 Here is a picture of how I used one of the Spellbinders Oval Nestabilities to make a backdrop for the popcorn. To do the popcorn first I put down all of the pieces that would be flat on the card. Then I added the popcorn container. The rest of the popcorn was put on with pop dots. Thanks for stopping by!! I hope you enjoyed the card. I hope you have a Wonderful Wednesday!! One of my favorite things to do in the summer time is visit the Butterfly Garden at the Minnesota Zoo. I don't know what it is about butterflies, maybe the fact that they represent hope and a new beginning, whatever it is they are some of the most amazing little creatures around! Their wings are so beautiful and delicate. The picture of the Monarch butterfly on the card is one that I took last summer. 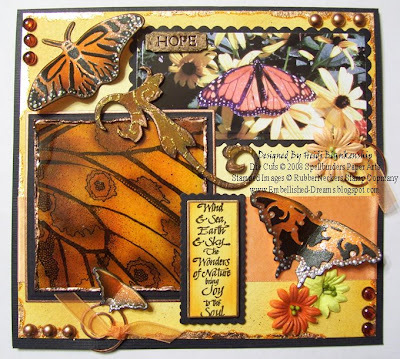 The beautiful butterfly die cuts were made using the Bugs (S4 008) die and the Flying Beauties (S4 123) die from Spellbinders. Each butterfly was cut, embossed, stenciled and air brushed using the Copic air brushing system and Copic sketch markers. To add the white dots I used Perfect Pearls from Ranger. The stamped image of the butterfly wing is from RubberNeckers and was stamped on paper Cryogen White CS using Brilliance Graphite Black ink and then the coloring was done with the Copic ABS and Sketch markers. Then I covered the entire piece with a dimensional glaze. Once that was dry I distressed the edges and then added some copper accents with the Copper pen from Krylon. 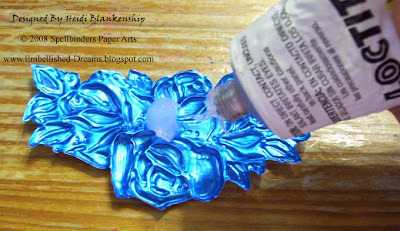 I love the krylon pens--they can add so much to a project! 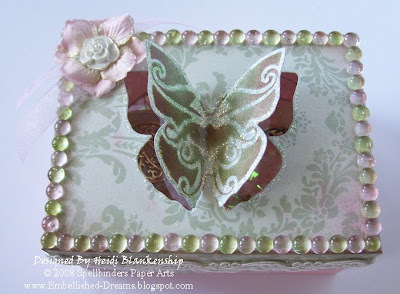 The butterfly picture and the sentiment were cut out and then matted using the MegaNestabilites Long Classic & Scallop Rectangle from Spellbinders. The sentiment is also from RubberNeckers. To add more copper accents to the card I did copper gilding around the edge or the card, added a couple pieces of hardware, a HOPE charm and also some dew drops. I finished off the card by adding flourish, it's a piece of grunge board that I airbrushed with the Copic markers and then added some stickles and a few prima flowers. Thank you for stopping by today and where ever you are I hope you have some sunshine in your day!! Happy Father's Day to my Dad and also to my husband Eric. Both of them are Terrific Dads!! This is going to be a really quick post. I just wanted to share with you the cards that I made for Father's Day. The first card is the one I made for my Husband from the boys. Our oldest son just got an electric guitar and all of the guys in the house like to play the guitar--guitar hero, rock band or the real deal. 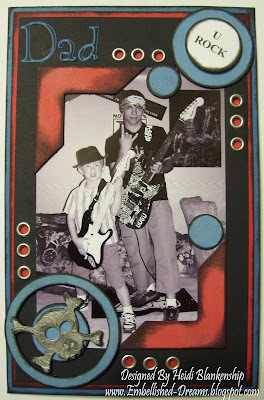 So I thought it would be fun to do a cool card with the boys and the guitars. Here is what I came up with.~ I think the picture turned out great!! The boys had fun taking the pictures and knowing that it was going to be on a card for Dad made it all the more fun. 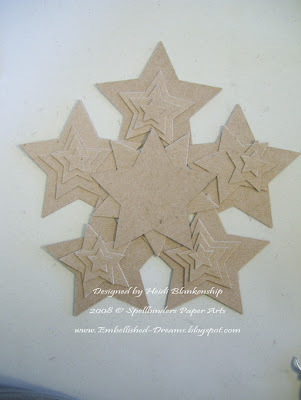 The circles and the corner elements are various pieces of chipboard. The skull and crossbones is a piece of grunge board. The letters from Dad are the Mystic font from Spellbinders. U Rock was printed on the computer. I also added some eyelets for embellishments. Thank you so much for stopping by today & I hope all of the Dad's had a wonderful day!! Do you ever see something in a store that you could alter and instantly get an idea? Well that's what happened to me when I was in Joann Fabrics one day and seen this little bird feeder. It was cute and had kind of a shabby look going on but I wanted to change it up a bit. 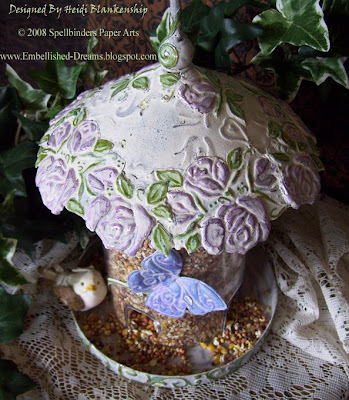 I decided to use the bird feeder for one of my Spellbinder Design Team gallery projects. 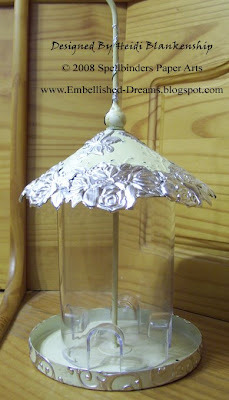 I started out by cutting and embossing ArtEmboss soft metal sheets (it's like a crafting foil) from Amaco using the Rose Blossoms Edgeabilities die (s4 044) from Spellbinders. If you haven't ever used the metal sheets it is really easy to work with and it works great in the Wizard. It comes in a variety or colors (with a silver back) and also in copper, brass and pewter. The colored foil can also be sanded, doing this really makes embossed images pop! I cut out enough pieces to go all the way around the top edge of the bird feeder. I wanted the foil die cuts to hold the raised embossing so I filled the back of the die cut with clear household silicone which also works great for an adhesive. You want to make sure you completely fill it in as shown here.~ Then I started placing the foil pieces around the top edge of the bird feeder. I let a little of the foil hang over the edge to give the bird feeder a little more dimension. Here is a close up of what the foil looks like once the top is done. I also wanted to add some foil around the bottom and on the hanger so I cut and embossed several pieces of foil using the Doodle Parts die (S4 121) from Spellbinders and following the same instructions as above I adhered the foil. 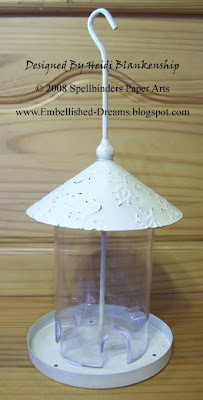 Here is a picture with the foil Doodle Parts around the bottom and on the hanger.~ Once I had all of the foil pieces adhered I let the bird feeder sit over night so the adhesive would dry and the silicone would firm up. The next morning I took the bird feeder apart so I could start painting it. I used Coffee Bean (brown) acrylic paint from Plaid for the first two layers of paint. You can just use a sponge brush to apply the paint. 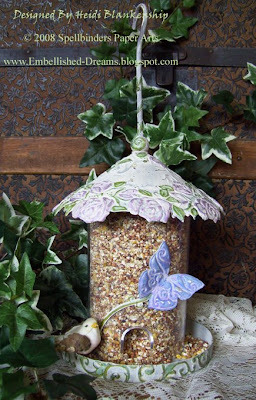 I wanted the bottom layers of paint to be dark so once the bird feeder was sanded it would have distressed or "shabby" look. After the brown paint was dry then I put on two coats of Parchment (ivory) acrylic paint from Plaid. Once all of the paint was dry then I lightly sanded all of the metal pieces. All of the coloring was done using the Copic sketch markers. Here is a close up of the top once all of the coloring was done. As you can see from the pictures I also added a doodle and a butterfly to the cylinder part . 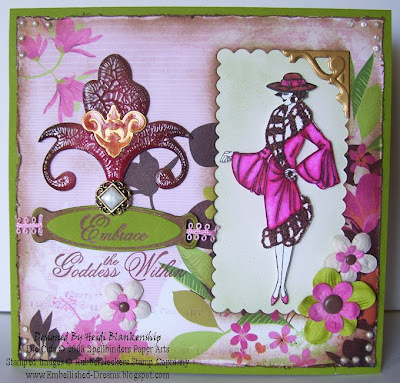 The doodle was done using the Doodle Part (s4 121) die and Flying Beauties (S4 123) die from Spellbinders. The doodle part was done exactly like the other foil pieces. For the Butterfly I made two die cuts, one was using the foil and it was cut and embossed and the other was just a die cut that was cut from brass. I did this so the butterfly would be more sturdy. On the foil piece I filled in the back with the silicone and then placed the brass die cut on the back. Once the butterfly was dry I painted, sanded and colored the doodle piece and the butterfly. Then I used an adhesive to adhere the pieces to the acrylic cylinder. 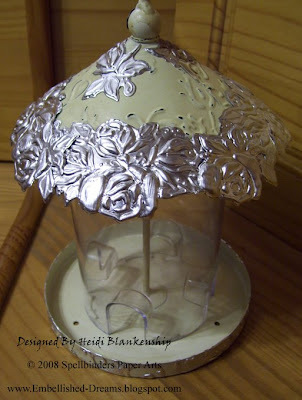 Here is the finished bird feeder.~ To see another beautiful and very inspiring project done with foil, be sure to stop by another Spellbinders Design Team Member's blog Paper Fections by Sharon Harnist. Sharon designed and altered a beautiful Herb Garden using the foil technique. 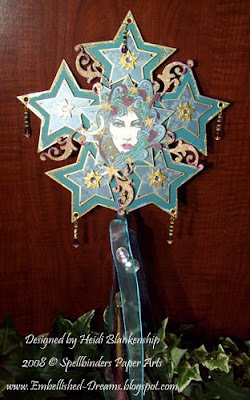 Using the Spellbinders dies and the foil you can take something that is ordinary and turn it into extraordinary! I bet you were beginning to wonder if I was ever going to get these posted! LOL! The first card is one that I made for my Mom. I started out with the stamped image from RubberNeckers and colored it with Copic markers. Then I started looking through my paper & I thought the image went perfectly with this designer paper Sultry from Basic Grey. On the flourish chipboard first I air brushed it using Copic markers and then I added Crackle Accents from Ranger. Just a Note ** adding the Crackle Accents on top of the Copic markers will give you a deeper color. The Flourish started out the same color as the dress on the stamped image. I used the Long Scallop Rectangle MegaNestabilities die (S4 143) from Spellbinders to cut out a rectangle in the BG paper and sponged the edges with brown ink. I used the ATC Card (S4 073) die from Spellbinders to make a corner accent on the rectangle and also on the flourish chipboard. The tag is a die cut from the Tags Trio (S3 150) die from Spellbinders and I did the Reverse Stenciling technique on the tag. 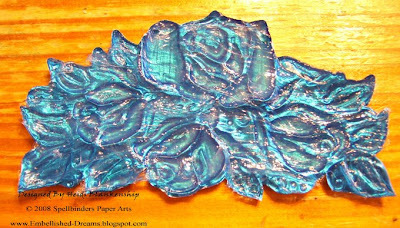 The Reverse Stenciling technique can be seen by clicking HERE. The edges of the BG paper were distressed and then sponged with brown ink. For embellishments I also added some perfect pearls, trim, flowers, brads and a button. This next card is one that I made for my mom to give to my Grandma. My Grandma loves purple and lavender so I thought these papers would work wonderfully. Here is a view of the front of the card when it is closed. Here is a picture of the inside.~ I know it might not look like it but this card was actually very quick and easy. I used my Score Pal (thanks Ema!! *wink*) to quickly measure and score the card base and then I used three panels of K&Company designer paper to dress it up. I mounted the card onto a larger base using two different colors of CS, purple 6 x 6 and lavender 5 3/4 x 5 3/4 and then I stamped a flourish image on each side & added some touches of glitter using stickles. 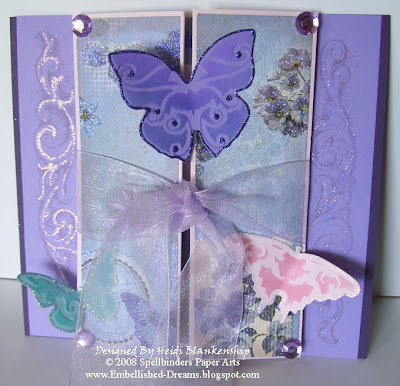 I cut, embossed & stenciled the butterflies using the Flying Beauties (S4 123) & Butterflies 2 (S3 146) dies from Spellbinders. To do the stenciling I used Copic sketch markers and the Copic ABS. I also added a little stickles to each of the butterflies. For the sentiment I stamped it using Brilliance Graphite Black ink and then I cut out the sentiment using the Large Classic Oval Nestabilities (S4 110) from Spellbinders. Thank You so much for stopping by!! I also wanted to say Thank You for all of the wonderful comments and personal emails from my last post!! Thank you for your thoughts and prayers! I always love hearing from all of you!! I hope you have a wonderful day!! I know I haven't been around for awhile but life has just been throwing us some real curve balls lately. Last week our long time friend and neighbor passed away, he had a massive heart attack and we were with his wife through the whole thing. It was very heartbreaking. They had been married almost 51 years. Then on Saturday my Dad was in a car accident, he is ok--thank God!! But the car was totaled and to make matters worse the people who caused him to have the accident never even stopped to see if he was ok!! I just can't believe some people!!! On top of all of this I have been having some problems with my arthritis. At my last doctor's visit the doctor told my that my arthritis has moved on to the next level and I now have rheumatoid arthritis. My inflammation markers keep going up so I have had to be on higher doses of some medications which has now started to cause some other problems. Last week I started a new medication which is an injection that I give myself. So far I haven't seen any changes but the doctor said it could take up to a month or month and a half before I might notice any significant changes. I am hoping for some positive results!! In my last post I promised to show you some cards that I made for Mother's day and I will still do that but for today I would like to keep this post sweet and simple. I would like to leave you with the sympathy card that I made for our neighbor. Thank you for stopping by today! I will try to get back to a more regular posting very soon. Take care & I hope you have a wonderful weekend! !